Oh My! 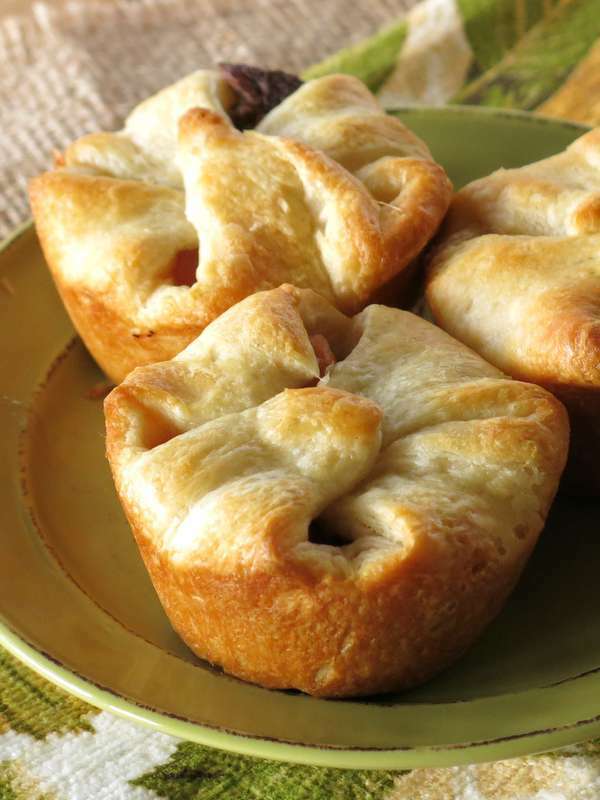 Mini Beef Pot Pies with Crescent Rolls may be the tastiest recipe you’ve ever made with leftovers. These are filled with beef and vegetables soaked in a red wine sauce. Do you hear this refrain at your house? But, I don’t waaaaant leftovers. I’m emphasizing the whiny tone. Sometimes, I’m the complainer. LOL! Well, this recipe will solve that problem! It completely transforms last night’s dinner! 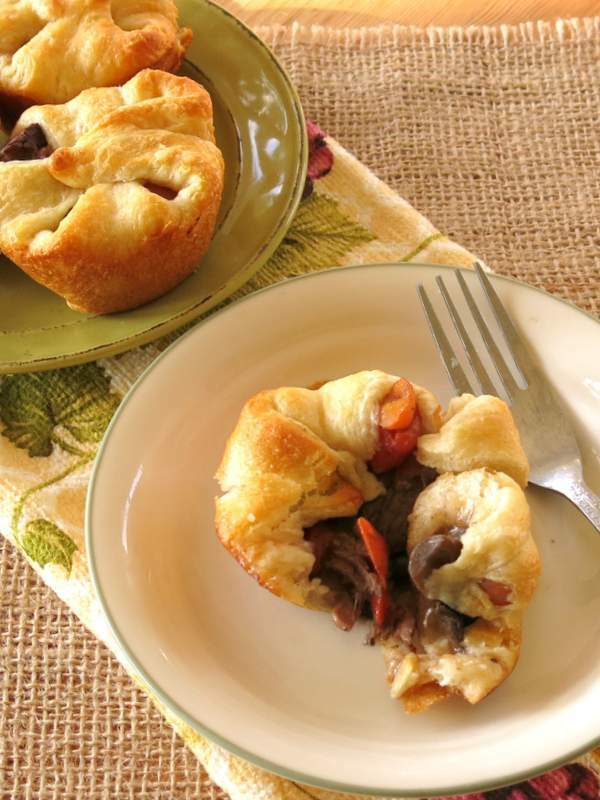 The red wine sauce is paired, with mushrooms, onions, carrots, tomatoes and beef in a soft pastry package will make your heart sing. It’s perfectly sized to be an appetizer too! 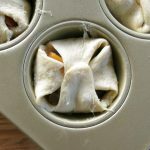 Refrigerated crescent roll dough makes assembly of a “pot pie” very easy. We’ve played around with this easy to work with dough before in Three Cheese Rosemary Pizza Bites and Easy Sausage Stuffing Balls. It’s a good convenience product to have in the refrigerator for impromptu occasions. About 2 cups of filling will make 8 mini pot pies. 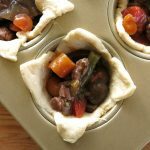 We used Crock Pot Beef and Vegetables in Red Wine Sauce for the pot pies pictured. Crock-Pot Beef Bourguignon is also a tasty option. Shred beef and cut the vegetables into smaller pieces if needed. Another very delicious option is to crumble leftover meatloaves, such as Sun-dried Tomato and Mozzarella Meatloaf or Meatloaf Muffins with Spinach and Pine Nuts, and fill the pastry. The meat filled pastry will melt in your mouth and warm your soul and make everybody very happy! Yummmmmmmmmmy! Roll the crescent roll dough out and press the seams together. Pastry sheets are also available so you can skip that step. I like the flexibility of having a can of rolls in the refrigerator. Either way, cut the dough into 8 equal sized squares using a pizza cutter or knife. Press the dough into a muffin tin coated with cooking spray, allowing the corners to hang over the edge. Fill the muffin tin with the beef and vegetable filling until it’s about level with the top of the muffin tin. Pull the corners to the middle. There is no need to brush the top with anything. The result is nothing short of an indulgent. Beware – these are very addictive! The lesson learned: Save your leftovers and make easy beef pot pies the next day. Cook once and eat twice that’s my motto! Tag @DinnerMom or #DinnerMom if you make this recipe. We’d love to see what you’re cooking up! Mini Beef Pot Pies with Crescent Rolls transform beef and vegetables in red wine sauce into an AMAZING dinner or appetizer. Using a pizza cutter or knife, cut dough into 8 squares. 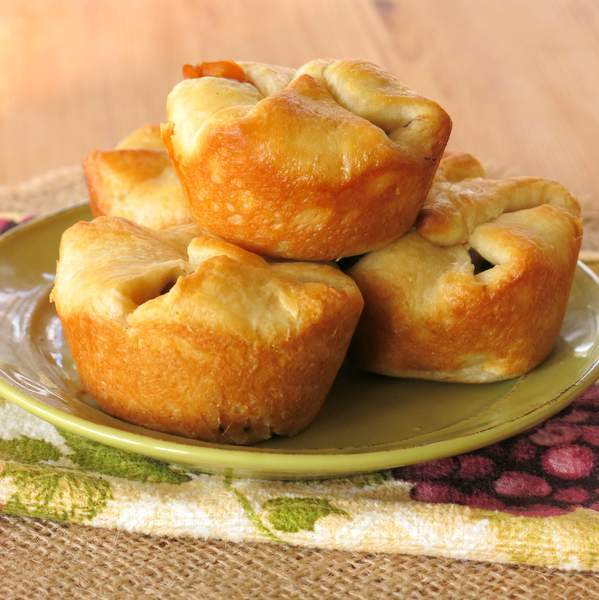 Press a square of the dough into a muffin tin coated with cooking spray, leaving 4 corners of the dough exposed. See picture below. Shred beef with a fork and cut vegetables into smaller pieces, if necessary. Spoon mixture into dough until it is even with the top. There is no need to spoon in extra sauce since the beef and vegetables are coated with it. Pull four corners of dough into the middle. Bake for about 15-20 minutes or until firm and browned on the top. Enjoy and thank you for pinning! Do you think these would freeze and reheat well? I’m always on the look out for meals I can take out of the freezer on busy nights. I’m wondering how these would do. Hi! I’ve never tried this. However, it appears you can freeze cooked crescent rolls. So, I think that you might possibly be able to freeze these too. Try completely cooling in the refrigerator before moving to the freezer. Good luck! Love this technique. Used it with a beef stew I made last night. Glad you enjoyed it! It really is a quick and tasty trick!